Ready or not Chattjack will get closer day by day …. Paddle Monster start CJ training in August after SEAPaddle and OABI which is usually around mid August. Nutrition – If you have not figure out your likes and dislikes with many of nutrition brand on the market then this time to start. Your body needs to adjust to the nutrition you take. Athletic wear from wind breaker to different cloth combination for unpredictable weather. Don’t be overwhelmed and panic at this moment. Plenty time to get ready for it but for some peeps stress level can rise up quickly. So here is simple FAQ style instead of making long post. What kinda training should I been doing to be ready for this year’s CJ ? I hope you been putting some paddling time but also some structured training. If you are not then don’t stress out. Chattajack website has Larry Cain’s training information for those are not in Paddle Monster training program. Lots of L2 HR zone for endurance training happens during this block of CJ training. “Quality not Quantity ” is my training motto. Should I use Heart Rate Monitor to train? If you are pretty serious about your training and able to perform best at CJ and other races then “Yes”. It will help you to properly train and also during the CJ it is important to stay in the right zone make it to the end. Highly suggest to own one. How do you figure out how long it will take for me to finish CJ and needs for nutrition ? Your might find that first 30-45min you will paddle hard in L4 zone to get in the position for those are in podium paddlers specially in draft train. Even you are trying to finish the CJ first 30-45min is intense part of CJ. After awhile you will drop into L2/L3 zone for remaining journey to the end. You will not able to paddle hard entire duration so sustain speed changes at different zone. If you can paddle nice sustain speed in your L2/L3 zone you will find yourself lot easier to finish CJ without getting too tired. You can calculate your average speed in L2/L3 zone and some L4 zone for 45min. That will get you some rough hours to finish the CJ. Off course river will have current so you will find yourself moving fast pace but also head winds is involved in some area. You are going through a valley and snake route so you will find windy area time to time. 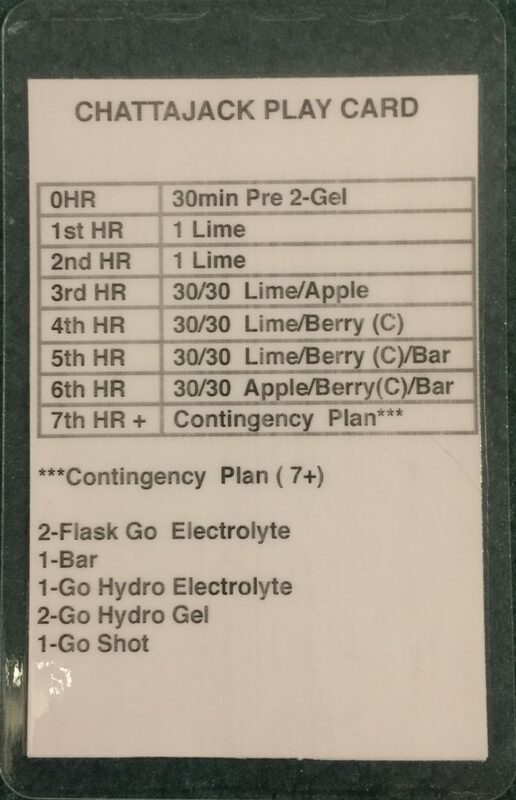 Once you figure out your rough time to finish your CJ then you can now figure out your hydration and gel you need to survive the 32miles of journey. What kinda nutrition do I need ? When it becomes to individual nutrition everyone has their own recipes that works for them. Personally I’m big carb guy, no solid food , energy gel and not much on protein. Dinner night before the race is important but also breakfast on the race day is important as well. How long you need to digest and how much of food your need before the race starts. If you are new to this you need to test out your actual race day breakfast few time before your race day. It will definitely give you the perspective on what you need to be ready. 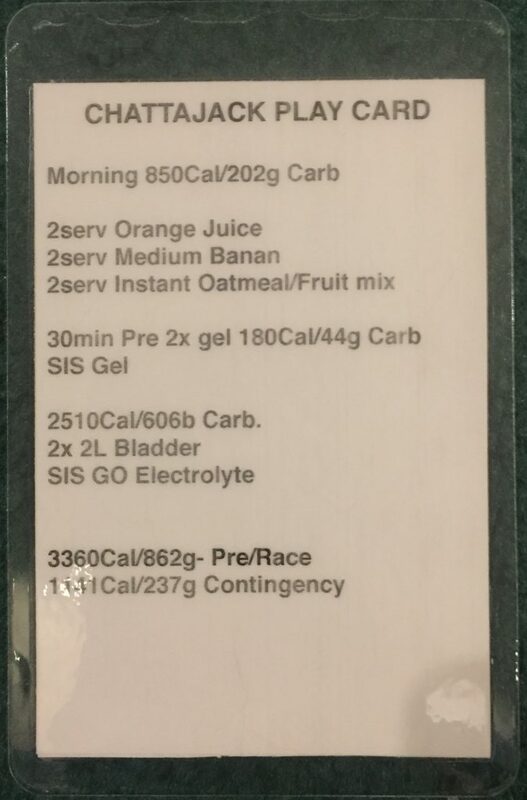 During the race hydration drink , gel and whatever you decide take on hourly basis very important. Keep feeding the body so you will not get hungry is very important to survive the race. Min of 500ml per/hr hydration is required for your drink. If you sweat or not intake a proper hydration is suggested to stay hydrated. Usually in cold weather you drink less but body uses fluid to warm up your body so it is essential to calculate your hydration amount correctly. Again everybody is different how they carry own nutrition but solid food is not for me. Some food category can digest easier then other food chain but just keep in mind it is not your immediate source of energy. Below is my famous CJ play card from 2017. This nutrition was well calculated and even coach Larry Cain was quite impressed with it. Some of the proper nutrition needs were suggest by SIS (Science in Sports) nutrition support. I had to tweak my intake during few of my long 4hrs training and this is proven to work for me. My CJ time was 6hrs20min and I end up not using 2 gel and I think I had about 1.5L left on my 2x 2L hydration setups. Is there any thing else you can share on CJ ? Just remember that CJ do have check point you need to clear 3 times before they will pull you out. If you can sustain minimum of 4MPH speed you will make the cut off at each check point and entire race mileage cut off time. 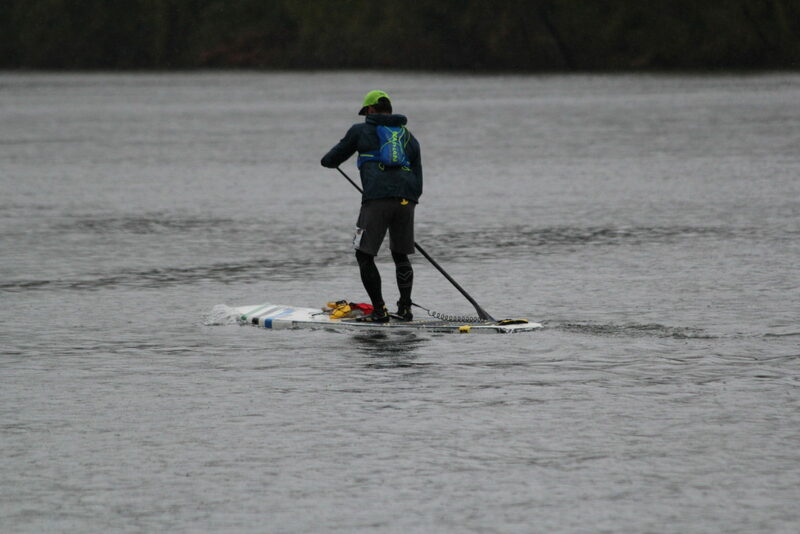 While they made most of the paddler can able to finish the race but other factor such as cold temp and cloth issues can effect your performance. Good thing is that water is still warm so if you ever fall in you will not get cold but you will get cold from the strong winds. Many of people bailed out from 45F air with heavy wind due to their cloth was too light. If you are not going to be draft train or able to find paddler that is in same speed to help each other you can be very lonely paddle for 32miles. I paddle almost over 90% solo other then passing few guys and chat for few min. Be prepare for your mental challenge as well as our physical challenge. Some listen to music to aid the mental challenges both in ear phone or blasting on the board. There is hardly no traffic that you need to worried about in general so you are pretty clear from any commercial boats that will sneak up on you. If you are able to focus and stay strong you will enjoy the last part of sprint which is pretty fun. Can I contact you if you have any other concerns about CJ ? Yes and please free to contact me anytime. Looking forward to answer your questions.